Maje hires U.K and Nigerian lawyers to sue Toke Makinwa over ‘fabricated’ book. Following the release of a tell-all memoir, "On Becoming", documenting her relationship with Maje Ayida, Toke Makinwa, has been asked to stop the sales of the book and all forms of promotional activities, via a “letter of demand," from Ayida's lawyers. In the book, Makinwa accused Ayida of giving her STDs, being a serial cheat and committing adultery. The legal documents describe the book as nothing but “exaggerated fabrication”. The book was said to contain “defamatory words”. Maje Ayida has hired law firms in both the U.K and Nigeria to handle the case. They are Carter-Ruck, a leading defamation law firm in the UK to top figures like Simon Cowell, Elton John and Chelsea FC while Kemi Pinheiro (SAN) of Pineiro LP is heading the legal front in Nigeria. 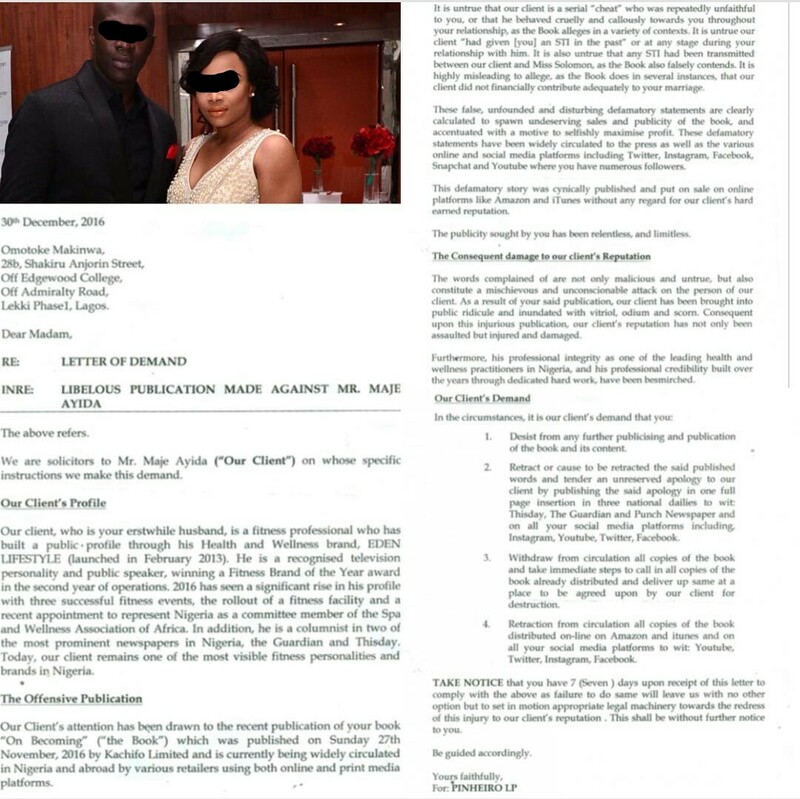 According to the letter of demand sent to Makinwa, Ayida was said to have “requested legal separation” from her “within 6 months” of their marriage in January 2014 — “when it became clear that the marriage was breaking down”. Makinwa was alleged to have signed a legal separation agreement in July 2014. The letter said it was well documented that Makinwa and Ayida had agreed to separate by July 2014, which the book failed to record. She was given 7 days upon receipt of the letter to comply with the demands or they’d be forced to seek legal redress. The letter was sent last year, but it's not sure if Makinwa got it. "The Lord shall fight for you, and you shall hold your peace🙏, Have you bought a copy of OnBecoming???? #africangirlskillingit#onbecomingmedatour #OnbecomingStrong#bestsellingauthor #Bestsellingbook ❤, You can purchase your OnBecoming from all the various bookstores in the flyer".